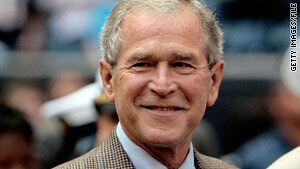 The Bush administration e-mails had been "mislabeled and effectively lost," according to the National Security Archive. "The e-mails themselves are not what we're getting," Sloan said. Documents related to the handling of e-mail under the Bush administration and subsequent information regarding how White House e-mails are currently archived will be released under a settlement with the Obama administration, which inherited a lawsuit the groups filed in 2007. But the National Archives must sort out which documents are covered by the Freedom of Information Act and which ones fall under the Presidential Records Act, which means they could be withheld for five to 10 years after the Bush administration left office in January, Sloan said. "The National Archives will sort this out," she said. The e-mail controversy dates back to the Bush administration's 2006 firing of the top federal prosecutors in nine cities. After congressional committees demanded the administration produce documents related to the firings, the White House said millions of e-mails might have been lost from its servers. Citizens for Responsibility and Ethics in Washington and the National Security Archive sued over the issue in 2007, arguing the Bush administration violated federal laws that require presidential records to be preserved. Court records have shown that the Bush administration knew about the e-mail problems as far back as 2005 and did nothing to fix them, Sloan said. "They never made an effort to restore them," she said. But Scott Stanzel, a former deputy press secretary in the Bush White House, said the group "has consistently tried to create a spooky conspiracy out of standard IT issues." "We always indicated that there is an e-mail archiving system and a disaster recovery system," Stanzel said. "We also indicated that e-mails not properly archived could be found on disaster recovery tapes. There is a big, big difference between something not being properly archived and it being 'lost' or 'missing,' as CREW would say." Monday's settlement allows for 94 days of e-mail traffic, scattered between January 2003 to April 2005, to be restored from backup tapes. Of those 94 days, 40 were picked by statistical sample; another 21 days were suggested by the White House; and the groups that filed suit picked 33 that seemed "historically significant," from the months before the invasion of Iraq to the period when the firings of U.S. attorneys were being planned. Also requested were several days surrounding the announcement that a criminal investigation was under way into the disclosure of then-CIA agent Valerie Plame Wilson's identity. That investigation led to the conviction of White House aide I. Lewis "Scooter" Libby on charges of perjury, obstruction of justice and lying to federal agents investigating the leak. Citizens for Responsibility and Ethics in Washington represented Wilson and her husband, former U.S. Ambassador Joseph Wilson, in a lawsuit over her exposure, which they argued was in retaliation for his accusation that the Bush administration over-hyped the intelligence used to justify the invasion of Iraq. A federal judge dismissed the case on procedural grounds in 2007, but Sloan said the missing e-mails raise the "strong possibility" that special prosecutor Patrick Fitzgerald never received all the documents he requested during the leak investigation.